Chiropractic is the science and art of locating misaligned vertebrae, called “subluxations”, which may cause distortions in posture. A vertebral subluxation occurs when one or more bones of the spine move out of position and put pressure, or stress, upon nerves branching out from the spinal cord. This pressure (stress) causes irritation on the spinal nerves and interferes with the signals, or information, traveling over them. Doctors of Chiropractic locate these subluxations, and through a series of gentle, specific chiropractic adjustments, correct the problem(s). Chiropractors are the ONLY professionals who undergo years of training to be the experts at correcting subluxations. 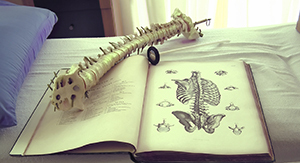 People of all ages are encouraged to have their spines checked regularly. A Doctor of Chiropractic should be part of every family’s health care team of professionals. Specific adjustment techniques are modified for patients in all ranges of age and size. No matter what your spinal problem or overall health status, a treatment can be personalized that will improve or correct your condition. Chiropractic can effectively treat neck or back pain, spinal disc problems, headaches, pinched nerves, leg pain, muscle and joint pain, carpal tunnel syndrome, sports injuries, and pregnancy discomfort and related pain. Yes. Chiropractic has been established as a healing art for over 100 years and, like any time-tested profession, has made many advancements. Due to Chiropractic’s proven track record, effectiveness and public demand, most, if not all, insurance plans cover Chiropractic Care. The office currently participates with over 20 insurance plans including HMOs, PPOs, and Traditional Indemnity Plans. And, the list is always expanding. A small amount of insurance plans have special requirements that must be met. So, please call the office today at 973-256-0311, and we will gladly verify your insurance coverage for you, without any obligation. I've heard that once I start getting adjusted, I have to get adjusted for the rest of my life. Is that true? The answer is a big, resounding NO! Correcting a painful condition usually requires several treatments, the number of which varies with the severity of the problem. If you are satisfied that you are no longer experiencing any discomfort, you can stop treatment. But, you may be so pleased with the results that Chiropractic can achieve that you return months or years later for treatment of other problems as they develop. In the beginning of care you are required to make repeated visits over a specified period of time to help fix the problem. Once the pain subsides, people sometimes stop with care. Although that’s fine, it isn’t always recommended. Most of the time the problem didn’t start overnight, and it won’t go away overnight. Adjustments are usually cut down in frequency as the pain diminishes, or they can be stopped when the cause of the pain has been corrected. However, it is recommended that you follow up with periodic care and get your spine checked regularly to avoid any future problems. Just like most people who go to the dentist to have their teeth cleaned and checked once or twice a year, you should also have your spine adjusted to maintain and promote good health.